Objective: The aim of this study was to document the findings in a case series of 43 patients diagnosed as having pervasive developmental disorder (PDD) and to show the relationship between these findings. Materials and Methods: This study on children with autism was performed in child neurology and child psychiatry outpatient clinics. After neurologic and psychiatric detailed history and examinations, developmental tests were performed and electroencephalographies (EEGs) were recorded. Results: In the systemic and neurologic examinations and investigations, findings of a specific disease that could cause autism was not detected. Among 34 of 43 patients, history of febrile seizures existed; eight patients (18.6%) had epileptic seizures, 14 (32.6%) had a period of autistic regression, and in the remaining 29 patients, the clinical picture had been present since birth. Among the 14 patients with regression, three had epileptic seizure histories. 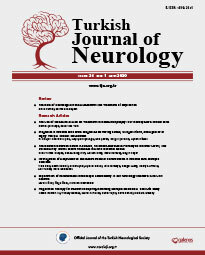 Twenty-two patients (51.2%) showed epileptiform activity (EA) in their EEGs. In 14 patients with autistic regression, nine (64.6%) had EA. Of the 29 patients with no history of regression, 13 (44.8%) had EA. In the group of 22 patients with EA, six (27.3%) had a history of seizures. Conclusion: The diagnosis of PDD is made according to detailed history and examination. A certain disease that can be diagnosed co-exists in only a small percent of patients. For this reason, laboratory tests can not show much benefit. On the other hand, EEG recordings have great importance in the measurement of background activity of the brain and the existence of EA. During autistic regression, EEG recordings can have great benefits for patients with or without clinical seizures. It may be possible to distinguish between stereotypical movements, tics and epileptic seizures with EEG recordings, which will be repeated in time in these patients.